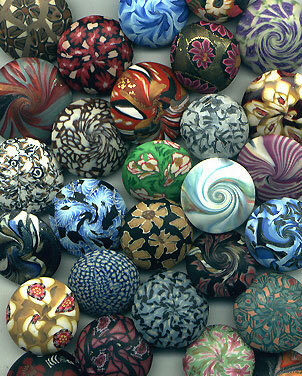 Making beads of polymer clay can be a very simple or very complex process. If something has a hole going all the way through it that can be used for stringing,it can be either a pendant (meaning that it hangs down from the top) or a bead. 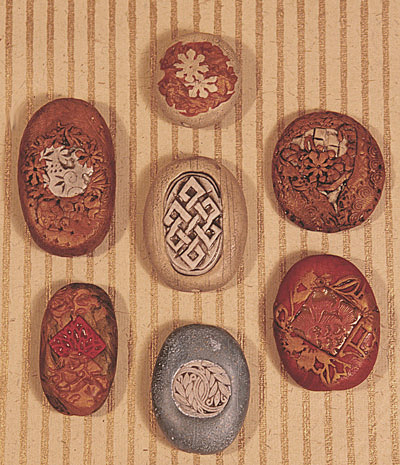 Beads can be round, tubular, shaped like river rocks, shaped like lentils, bicones, cut into thin slices called “heishi”, large or small and any size in between. Some are shaped like animals, bugs, shells, flowers, or other natural and fantasy forms. Even body parts, like heads and hands can be beads. Because the colors available in polymer clay are so intermixable, many polymer clay artists keep track of their color palettes and mixtures by creating a bead strand, or they will keep one bead from every batch as an artistic record of their work. Beads can be decorated using a variety of methods, including millefiore (meaning “thousand flowers” in Italian) adapted from Venetian glass making cane work techniques. Polymer clay artists borrow and adapt techniques from all sorts of media, including glass, ceramics, and even cake frosting! 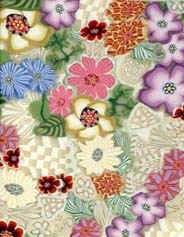 In making millefiore designs, no paints are used, only colored clays or glass. Individual slices, called “murrini” are placed to build up even more detailed images. 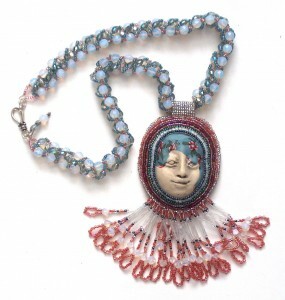 Other techniques include molded, stamped or impressed beads, color manipulation such as the Skinner Blend, mica shift, paint applications, reticulation, filigree, andmore! Clays can be used with metallic foils, embossing powders and inks as well other decorative inclusions. More ways of using polymer clay and techniques for incredible effects are being discovered and furthered every day by artisans around the world. 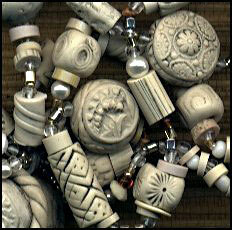 Many different canes and other embellishments are used in a kind of clay appliqué to make our very popular Girl Beads. We’ve opened a store at Etsy to sell our beads, face cabochons, and more! In the books Create A Polymer Clay Impression and Celebrations With Polymer Clay many techniques for making beads are shown in detail. All it takes is lots of time, patience, and of course, some polymer clay! Here is a Mehndi Hand Bead with silver wire to form a pendant loop, and silver bells. The henna-like designs are made with cane slices in the millefiore style. 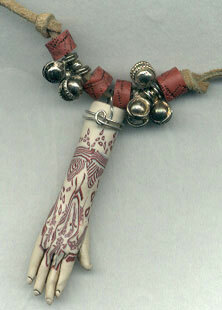 The one shown here is strung on a simple leather cord, with faux coral polymer accent beads and some silver bells. Jewelry that moves and makes sounds gives an extra level of fun! 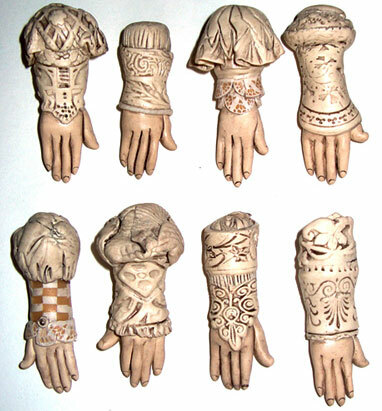 Tattooed Hand Beads suggest tribal designs inked into permanent mementos–and these designs ARE inked, using dye inks on individually formed polymer clay hands and a huge collection of stamps developed over many years accumulation. Designs can also be traditionally colorful-though the blue versions are my favorites, and many people seem to agree. I’ve just designed a NEW set of stamps specifically for these beads, so check back later in the year to see what’s being made! 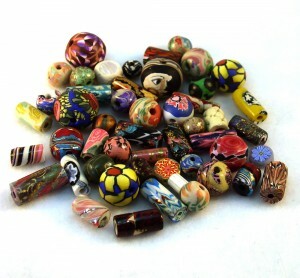 Victorian Hand Beads are also costumed in a wide variety of period costume styles. These are some of my favorite beads to create…and I think it shows. Playing “dress-up” with each one is a lot of fun..
From Renaissance through Victorian and on to many other modes of dress, these beads are very unique. No two are costumed exactly alike. 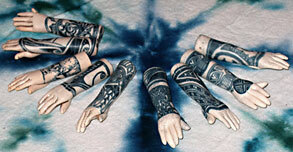 Many are done in faux ivory, but versions with colored costumes are also available by special order. Hands can be used as a special dangle at the end of bead amulet bags, as single pendants, or in a grouping with other beads you’ve come to treasure! I love stringing them into necklaces, although they look great by themselves on a cord as well. I like to use them as ornaments on Holiday trees too. All Hand Beads are pierced from side to side at the top of the arm area. And doesn’t everybody need an extra hand now and then? 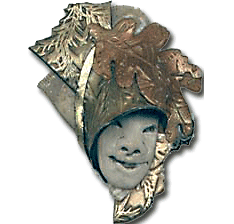 Bonnet Head Beads are also individually costumed and made with meticulous placementof many detailed bits and pieces. 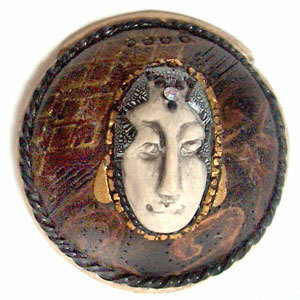 These beads and the Face Pendants both make use of polymer clay face cabochons. After an original face is modeled by hand, each is cast into a RTV Silicone mold and replications are then used to create these beads–they are also for sale individually for those who want to make their own Bonnet Heads or dressed pendant pieces by adorning them with more clay and re-baking. 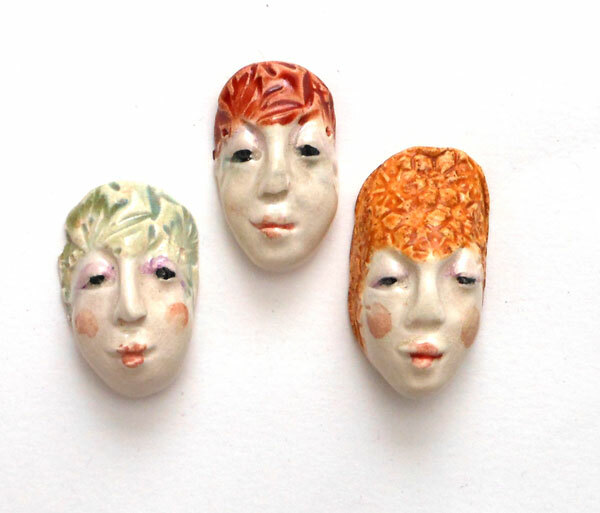 I’ve also been using these faces to make central focal pieces for necklaces and to create molds for using with ceramics and glass! Polymer clay has so many versatile uses. No two artists use it exactly the same ways. One of my favorite parts about using polymer clay is that I can try so many different techniques, and I never get bored exploring the possibilities. Laura Humenik made the necklace shown here using one of my babushka face beads. Molds created from antique buttons, architectural details like knobs and moldings, toys and textured fabrics, and even pieces of pressed or cut glass along with two part mold making silicon provides all sorts of interesting textures as do rubber stamps. Pre sses from these molds are also used to make beads. Along with other faux ivory beads, the bonnet head beads are made of monochromatic tones of palest ivory to darker bone or the buttery tones of older bakelite pieces, bronze, or black. I like to string them in to necklaces or make them into hatpins. Every one is hand formed and detailed, and some are baked in several different stages and then compiled into one beautiful bead. It is also possible to mimic many other classic bead making materials such as ebony, jade, turquoise, cinnabar and wood. 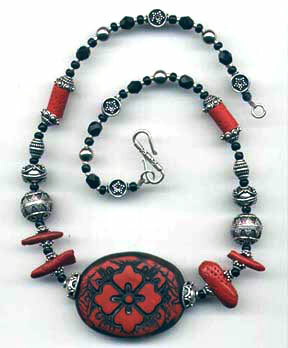 Nan Roche’s tutorial on making faux cinnabar inspired the bead seen above. 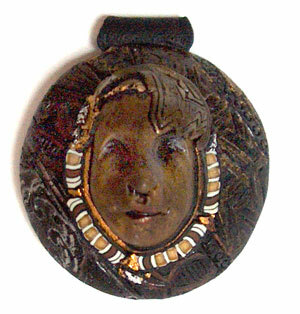 Instead of using stain to darken the recessed areas, this technique uses a very thin sheet of black clay on top of the red clay, and raised areas are sanded off to expose the underlying color. Each bead is textured and cured in an oven, then carefully hand stained if necessary using my own recipes of acrylic paints, mica pigments, and Rust-Oleum Varathane as a carrier medium. This gives an antiqued effect. There are so many techniques that can be used to decorate beads. Mica shift, textured, faux enamels and brocade effects using acrylic paints, cane work, inlay, backfilled with raw clay after baking and so many more. Beads are a great way to experiment with techniques in a small way. 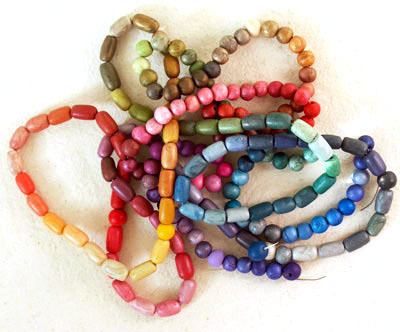 Lentil Beads are a wonderfully wearable shape. They are also lots of fun to make. Some people make them over light bulbs in two sections, and some make them in one solid piece and drill them after baking.